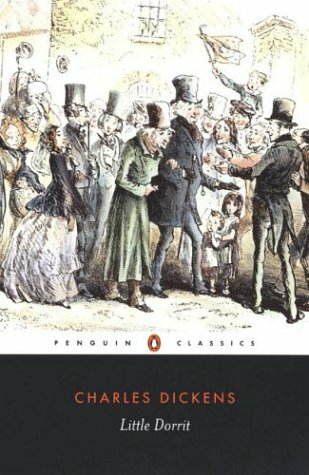 Every now and then, I turn back to the classics and remind myself why they are “classic.” Charles Dickens has always been a favorite of mine, but I had never read Little Dorrit. I picked up a Wordsworth edition (over 800 pages with introduction, preface and footnotes) which sat on my “To Be Read” shelf for several months before I plucked up the energy to tackle it. Once I started, I couldn’t put it down. The story is simple: a few good souls struggle with fate’s decrees, society’s vagaries, fools and evil-doers to find “a modest life of usefulness and happiness.” Oh, but what innocent souls, twisted evil-doers and delicious fools! There’s a reason why “Dickensian” is applied to certain well-drawn characters. Dickens saw deep into the heart of humankind and had a wonderful facility for bringing people to life in lush eccentric detail. Amy Dorrit, as the titular character, is tiny in size, but huge in impact. She’s gentle, giving, industrious and the emotional bulwark of her family and friends. In spite of being born and raised in a debtor’s prison where her gentleman father was incarcerated for over twenty years, Little Dorrit is beloved by all who come to know her. Arthur Dennam is a man entering middle age and haunted by a secret he suspects and his mother won’t divulge. He’s an honorable man and wants no one hurt on his behalf. But he falls into the trap of denying his emotions and settling for less than he’s worth. An ocean of Barnacles encrust the ship of state in Little Dorrit and they, allied with the aristocratic Stiltstockings, make sure nothing of any value gets done by parliament or bureaucracy. There are also murderers, innocent lovers, social climbers, treacherous and virtuous servants, grand society matrons and tobacco sellers. All are dissected; their virtues and flaws laid bare by Dickens’ skillful scalpel. One of his most delightful inventions is the Circumlocution Office, mostly run by the aforementioned Barnacles and Stiltstockings, whose sole purpose is to tie up any creative enterprise or invention with so much red tape that it is smothered out of existence. They hone and perfect the art of “How Not to Do It” (in more modern terms “How to Do Nothing.”) Dickens includes a chapter entitled “Concerning the Whole Science of Government” which illustrates his frustration with gridlocked government and ineffectual financial regulators. Aristocratic society comes in for its share of sharp wit, as well. Mrs. Merdle, whom Mr. Merdle married to further his place in Society, is most often referred to simply as “the bosom” upon which she displays her wealth as a sign of power. The Barnacles, Stiltstockings and Merdles live in “inconvenient houses smelling of yesterday’s soup and carriage horses” because it is a fashionable street. They all bitterly denounce any politicians who compromise with “the mob”—anyone not aristocratic, no matter how wealthy or educated. The middle class and poor receive a few licks for their tolerance of upper class airs and their fear of “foreigners.” The following passage could describe many a modern American’s attitude towards immigrants. In summary, if you’re looking for a meaty read, you can’t go wrong with Little Dorrit. Borrow it from the library, download it free (it’s in the public domain,) or pick up a cheap paperback. It’s well worth your time to revisit a classic author and see how little things have changed in 150 years. Enjoy!